Take a look these clever ideas for using tiered cake stands, vintage or new! Last weekend, I was invited to a sneak peek event at a new home decor shop that specializes in vintage, collectibles and shabby chic. These types of shops tend to be my favourite because you never know what you’re going to find, and they’re different every time you go back. As some of you already know, I stopped buying anything I don’t have a dedicated purpose for a couple years ago (even if it’s a great deal). It does take a bit of the fun out of vintage decor shopping, but not having to deal with cluttered storage rooms later is worth it (not to mention the money I no longer waste)! After exercising a lot of restraint, I left the shop at the end of the evening with one vintage tiered cake stand in silver. At just over $20, I think it was a steal since, from what I can tell, most sell for more than $40 on Etsy. 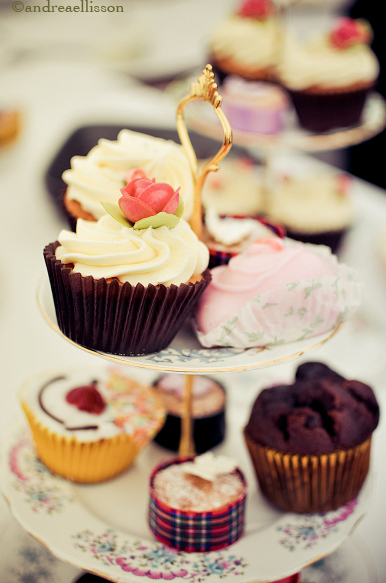 Of course, one of the more popular ways to use any tiered cake stand is for cupcakes or treats. 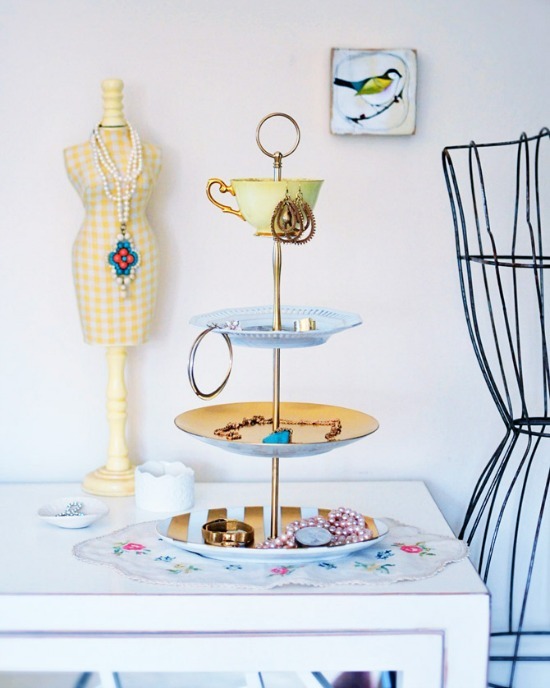 The Marvelous Vintage Tea Party Co.
Another way I could use my silver tiered stand is to store some of my jewelry. Although I still use my vintage tea cups and saucers to hold most of my earrings, bracelets and necklaces, there are a few chunky pieces I still want to put on display. I think what I’m most looking forward to is using my tiered cake stand for seasonal decorating. Do you have any other ideas for using tiered cake stands, vintage or new? I’m so glad you stopped by! If you’re new to Satori, please take a moment to subscribe. Hey! My mom has that same cake stand!! Cool find Shauna! As soon as I saw it I knew I wanted it. I’m sure you’ll be seeing it in photos to come. Thanks for stopping by. Enjoy the warmer weather today! Gorgeous, Shauna! Those are so versatile, I’m sure you will have fun using it in so many ways. Love this post, Shauna! The cake stands are stunning, especially the one you picked up for yourself… and the photographs are beautiful! I am off to share this post on G+. You always share so many great round-ups of ideas!! Thank you, Sheila! I thought you may like this one! A little different styling than Audrey Would!, but I adore it! Oooooo! So pretty. I’m a sucker for shabby chic-y vintage shops too, and I always have to restrain myself from buying armfuls of goodies! 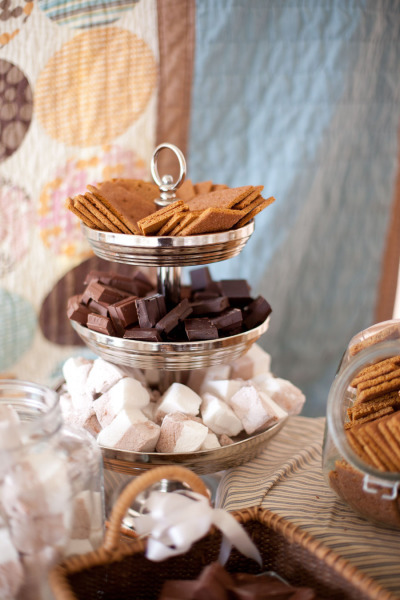 These are some great ideas – I’m loving the s’mores display! Yes, exercising restraint in those stores is a tough one. That s’mores one is definitely one of my faves too! Loving your cake stand Shauna! I love cake stands too – they’re just so pretty! I even use one in my kitchen as a fruit ‘bowl’! That’s a fantastic idea. I wish I had more counter space. My next house, for sure! That was definitely a great find Shauna! 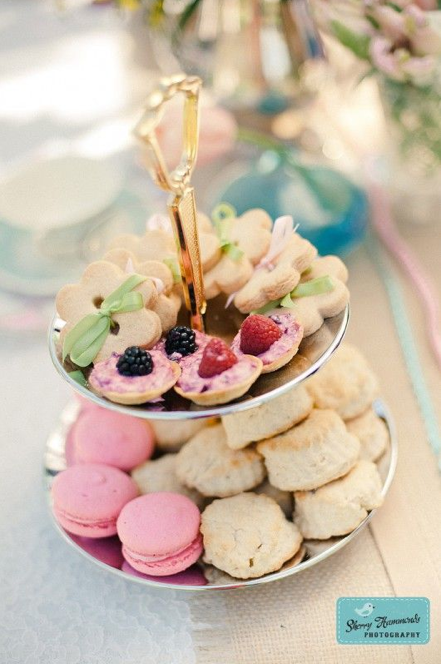 I love a pretty tiered cake stand. They make the best display piece! I LOVE the ideas !! 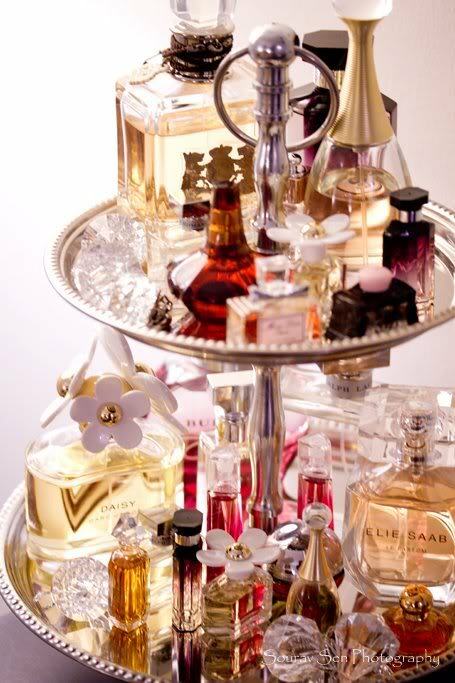 The perfume bottles are t’die for ! Thanks for the great ideas to use the stand for something other than for cookies…. although now I have a cookie craving. LOL. Oh, to have a collection like that. So many fragrances make my nose run and I’ve only found a couple that don’t bother me. But, it’s soooo… beautiful! 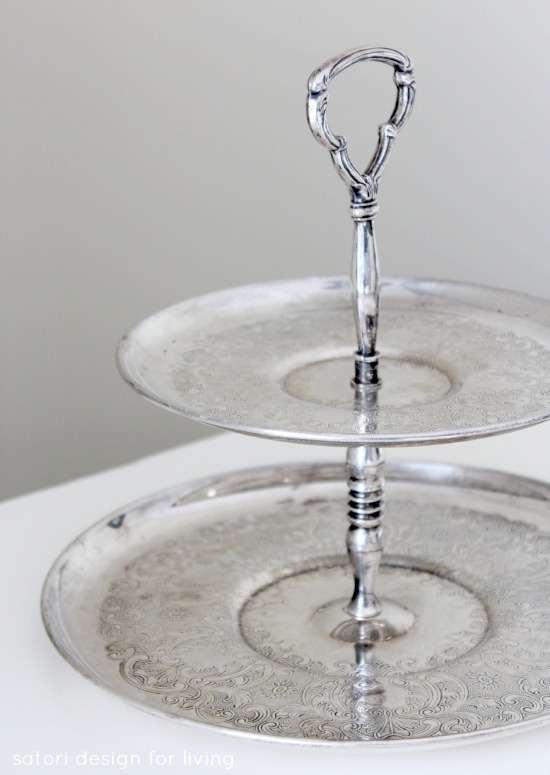 Oh no, now I want an antique silver tiered cake stand, it’s beautiful, so many things you could do with it!!!! 20$, that’s a steal! What a fabulous find! I love all the ideas but my favorite has to be the last one with the Christmas ornaments! Oh no… Now I want one too!!! Your cake stand is beautiful, and I just love silver too! Yours looks like it’s in perfect shape and what a great price!! Your inspiration was lovely too Shauna, I like them filled with treats and for other uses too.